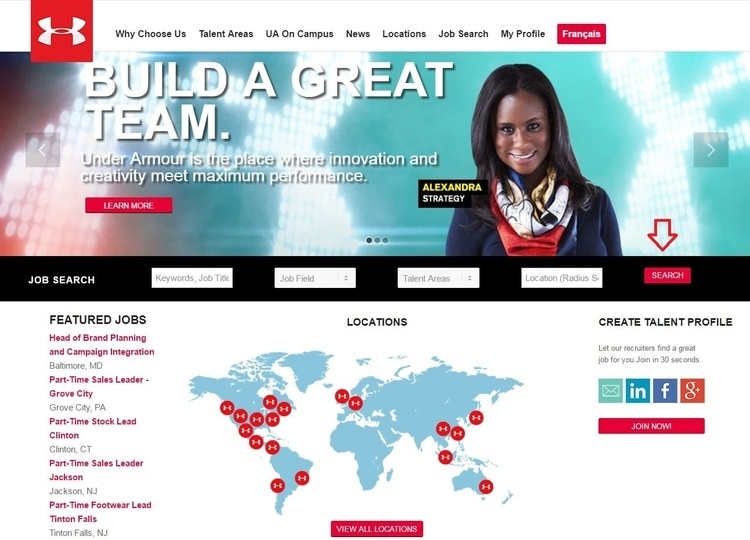 Visit underarmour.jobs and begin with searching for the desired job. You can search by keyword, job title, job field, etc. You can also click "VIEW ALL LOCATIONS" to see current job openings. A list of applicable jobs will be given according to your search. Click the one you want to apply for. Pay attention to the location. Job description is necessary for applicants to better understand the job's requirements, functions and so on. When you click the "Apply" button, more information about the job and the company will be offered. And you just need to confirm your willingness to apply by click the Apply button. You are eligible to apply only when you have an account. Otherwise you will be required to create an account. 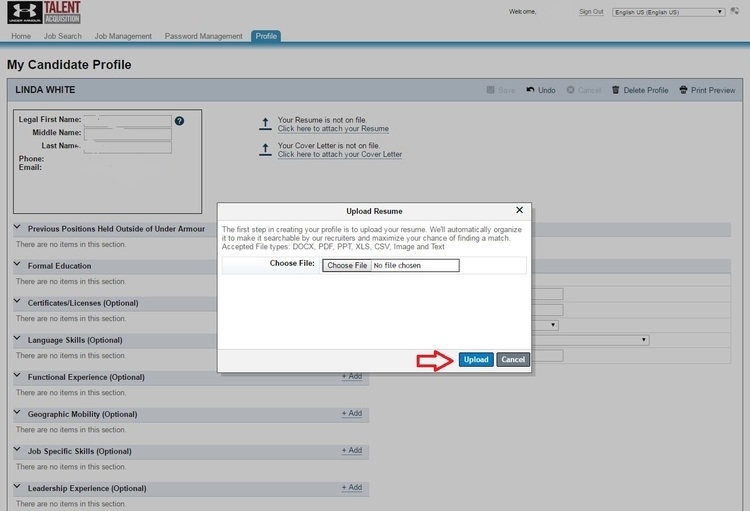 Provide your email, your name and set your password, and choose to "Create Account", and you are now an user. The first step in creating your profile is to upload your resume. DOCX, PDF, PPT, XLS, CSV, Image and Text are acceptable. Add items in your profile to provide your personal information for the recruiters. You can also provide your phone number, address and zip code. When finished, save your profile and continue. Complete the application by filling in the blank fields. In this page, you are required to provide your employment information and voluntarily choose your gender and race. And then make voluntary self-identification of veteran and disability. Entering your name and date in the blank field to indicate that you agree to the Legal Waiver and Certification statements. Last step in this page is to answer the following questions. Submit and your application will be sent. 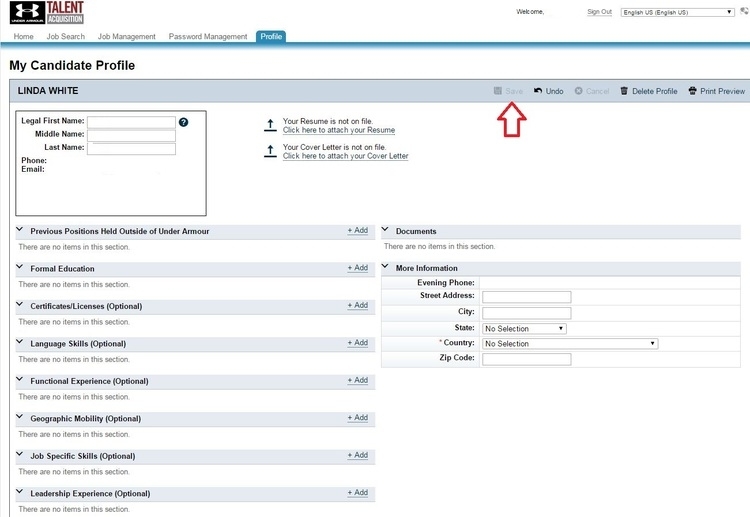 When you have completed all the required fields and click the Apply button, you will be notified by the system that your application has been sent. Wait for the interviewers' call and good luck! 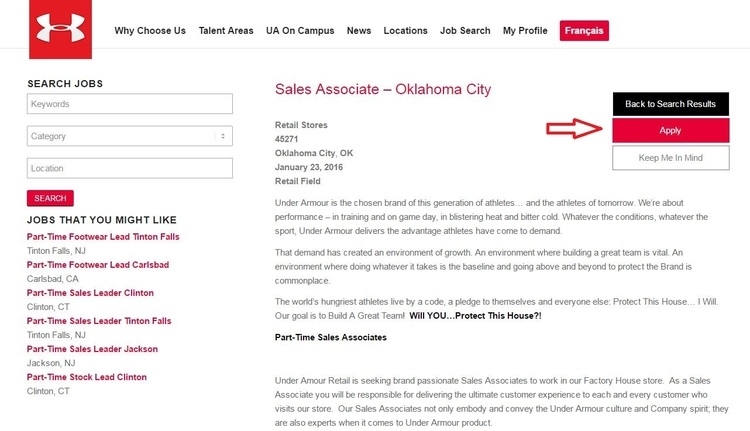 Click underarmour.jobs to apply for Under Armour jobs online.